It was supposed to be a commentary on overpopulation and global warming. 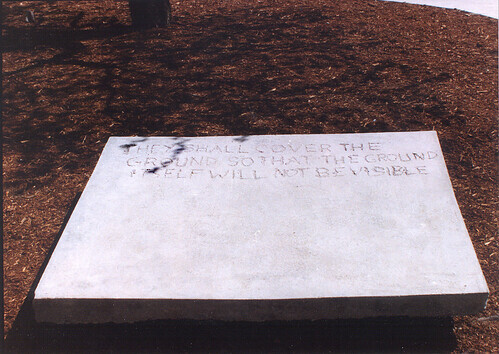 The quote was inscribed on a 750 pound slab of cement made to look like a typical piece of sidewalk. 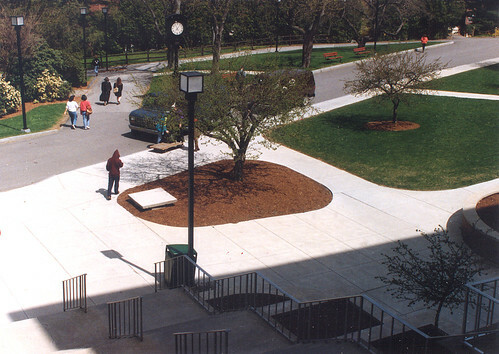 I proposed and received permission from the Vice President of the College to install the slab on an island of mulch surrounded by concrete in front of the college campus center. The installation coincided with the annual spring fine arts majors’ show in the middle of April. Buildings and grounds transported the slab from the sculpture studio with a fork lift and the difficulty in doing this safely led them to delay removing the slab at the end of the show. On April 29th 1992 four Los Angeles police officers were acquitted of criminal wrongdoing in the beating of Rodney King. A bystander from a balcony had videotaped what looked to most (including myself) like a merciless beating of King by the officers with nightsticks. Yet, a jury found the officers not guilty on April 29 and six days of rioting followed in Los Angeles. I watched with many friends the near-continuous and instantaneous coverage of the riots on television. However naive it may have been, we all did our best to make sense of the riots. Meanwhile the slab of cement was still there. It was now being interpreted by some I spoke with in the context of the riots. “They” had become abusive powers and the “ground” had become the truth. In the middle of May, Buildings and Grounds finally decided the safest thing would be to crack the slab apart before moving it. I didn’t get to see it, but the B & G guys said it busted up easily and they tossed the remains in the dumpster.